by Janice Haywood . Chalice Press, 2007. 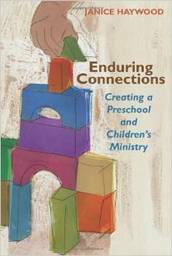 “Does your church have a focused goal or vision for preschool and grade-school ministry?” With this question, children’s ministry specialist, Janice Haywood, launches a conversation on the range of concerns that she believes congregations should address for effective childhood ministry. Does your church consider children a valued component of the congregation? Do parents receive support? How’s the communication system? Is your church safe? Is there a guiding committee? This is just a sampling of the issues that are covered. Responses to each question are both practical and inspiring, with encouragement, theological and biblical support, and practical tools. Appendices contain a sample congregational survey on children’s ministry, age-level concept development charts, a parent guide for helping children worship, and more.